Chapter The Sea and Bronze Age Transformations, by Christopher Prescott, Anette Sand-Eriksen, and Knut Ivar Austvoll, In: Water and Power in Past Societies (2018), Emily Holt, Proceedings of the IEMA Postdoctoral Visiting Scholar Conference on Theories and Methods in Archaeology, Vol. 6. NOTE. You can download the chapter draft at Academia.edu. Along the western Norwegian coast, in the northwestern region of the Nordic Late Neolithic and Bronze Age (2350–500 BCE) there is cultural homogeneity but variable expressions of political hierarchy. Although new ideological institutions, technology (e.g., metallurgy and boat building), intensified agro‑pastoral farming, and maritime travel were introduced throughout the region as of 2350 BCE, concentrations of expressions of Bronze Age elites are intermittently found along the coast. Four regions—Lista, Jæren, Karmøy, and Sunnmøre—are examined in an exploration of the establishment and early role of maritime practices in this Nordic region. It is argued that the expressions of power and material wealth concentrated in these four regions is based on the control of bottlenecks, channels, portages, and harbors along important maritime routes of travel. As such, this article is a study of prehistoric travel, sources of power, and maritime landscapes in the Late Neolithic and Early Bronze Age of Norway. Migration: The CWC was the result of a small‑scale immigration, but did not trigger substantial change. Eastern and limited impact: The CWC was primarily located in small settlement patches in eastern Norway. Terrestrial: In terms of maritime practices, the CWC does not represent a significant break from older traditions, though it seems to have a more pronounced terrestrial bearing. It is conceivable that pastures and hunting grounds were a more important political‑economic resource than waterways. The mid‑third millennium in Norway, around 2400 BCE, represents a significant reorientation. Bell Beaker Culture (BBC) settlements in western Denmark and Norway archaeologically mark the instigation of the Nordic LN, though much of the historical process leading from the Bell Beaker to the Late Neolithic, 2500 to 2350 BCE, remains unclear (Prescott 2012; Prescott and Melheim 2009; Prieto‑Martinez 2008:116; Sarauw 2007:66; Vandkilde 2001, 2005). Still, the outcome is the establishment of the Nordic region of interaction in the Baltic, Northern Germany, Sweden, Denmark, and Norway. The distribution of artifact materials such as Bell Beakers and flint daggers attests to the far‑flung network of regular exchange and communication. This general region of interaction was reproduced through the Late Neolithic and Bronze Age. The Nordic region in the Late Neolithic and Bronze Age. 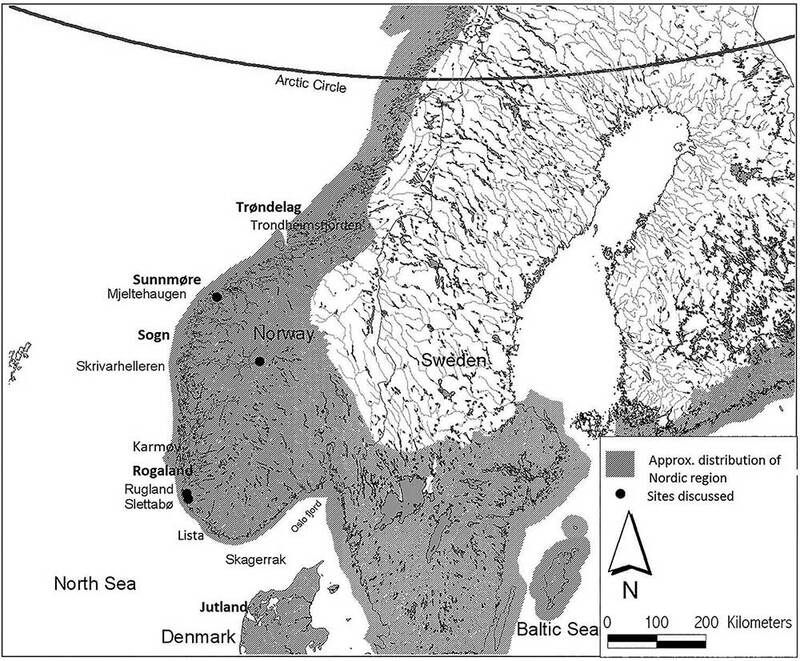 Sites and regions discussed in the text are marked (ater Prescott and Glørstad 2015:ﬁg. 1). The transition from the preceding Neolithic period hunter‑gatherer societies was rapid and represents a dramatic termination of hunter‑gatherer traditions. 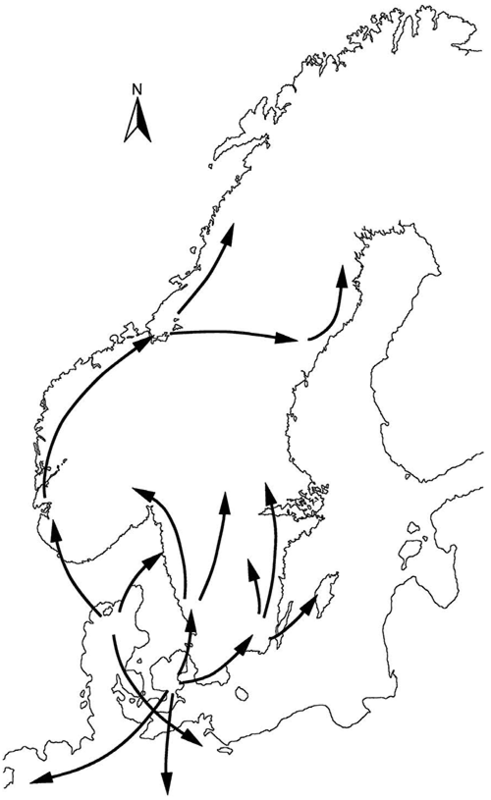 It has been argued that the transformation is tied to initial migrations of people to the western coast of Norway from BBC areas, possibly from northern Jutland (Prescott 2011; Prescott and Walderhaug 1995:273). Bifacial tanged‑and‑barbed points, often referred to as “Bell Beaker points,” probably represent an early, short phase of the BBC‑transition around 2400 BCE. In Norway these points have a predominantly western and coastal distribution (Østmo 2012:64), underscoring the maritime nature of the initial BBC‑expansion. Distribution routes for LN1 flint daggers type 1 suggesting communication routes and networks. (Redrawn after fig. 9, Apel 2001:17). (…) In response to the question about what attracted people from Bell Beaker groups to western Norway, responses have hypothesized hunting products, political power, pastures, and metals. Particularly the latter has been emphasized by Lene Melheim (2012, 2015:37ff). A recent study by Melheim and Prescott (2016) integrated maritime exploration with metal prospecting to explain initial excursions of BBC‑people along the western coast and into the fjords. Building on the archaeological concept of traveling metal prospectors as an element in the expansion of the Bell Beaker phenomenon, in combination with anthropological perspectives on prospecting, the article explores how prospecting for metal would have adjusted to the landscapes of western Scandinavia. Generally speaking, prospecting seldom leads to successful metal production, and it is difficult to study archaeologically. However, it will often create links between the prospectors’ society and indigenous groups, opening new territories, and have a significant transformative impact—on both the external and indigenous actors and societies. While the text echoes the traditional idea that Corded Ware spread Indo-European languages, Prescott (since Prescott and Walderhaug 1995) is a supporter of the formation of a Nordic community and a Nordic (i.e. Pre-Germanic) language with the arrival of Bell Beakers. An identification of the Corded Ware language as of a previous Proto-Indo-European stage is possible, as I have previously said (although my preference is Uralic-related languages). This CWC language would thus still form the common substrate to both Germanic and Balto-Slavic, both being North-West Indo-European dialects, which spread with Bell Beakers over previous Corded Ware territory.